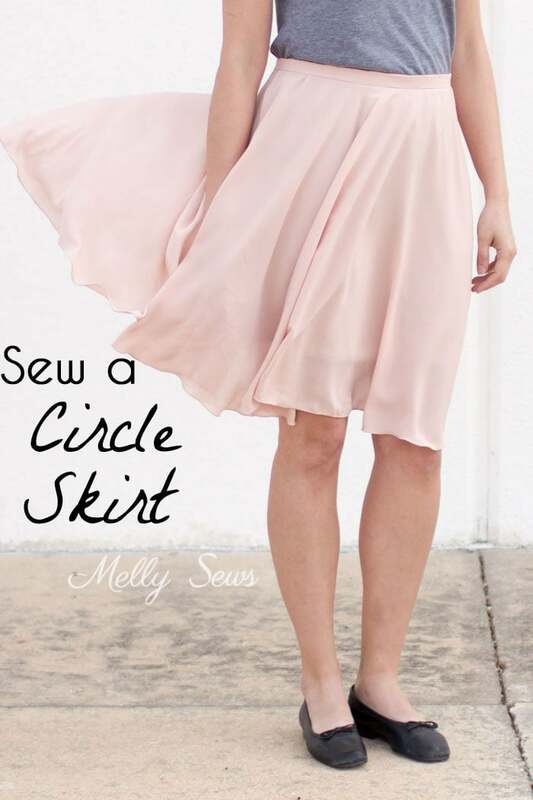 Hey y’all, today we’re going to talk about how to sew a circle skirt! 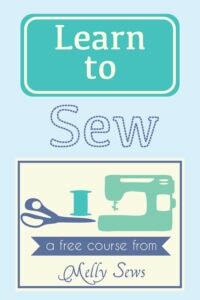 I’m going to show you how to make one with a waistband and invisible zipper. Did you know that for 3 years – kindergarten through first grade – I refused to wear pants? Dresses and skirts only, and the twirlier the better. 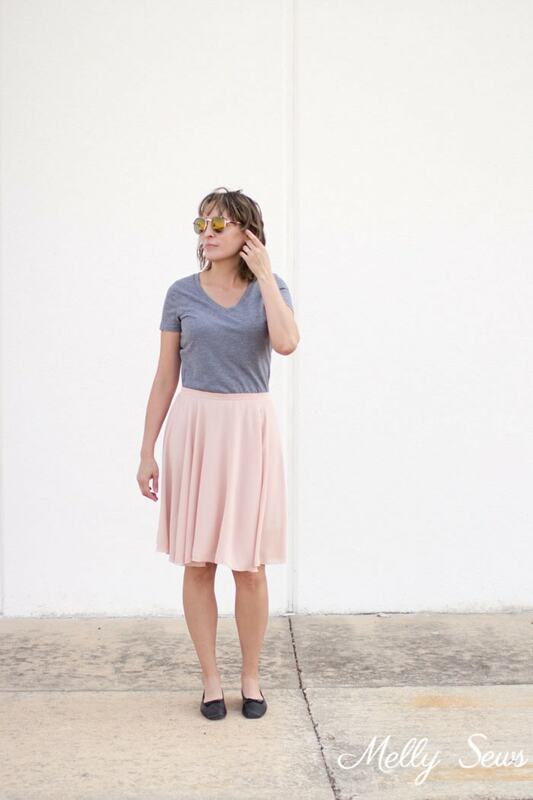 And though I’m grown and wear pants regularly now, the little girl in me comes out when I wear things like this swishy sheer crepe circle skirt in this blush color. 1 3/4 yards of 60 inch wide fabric for an adult skirt that will be around 22-25 inches in length. For a child’s skirt, double the length you want it to be and add about 8 inches, and that’s how much yardage you’ll need. 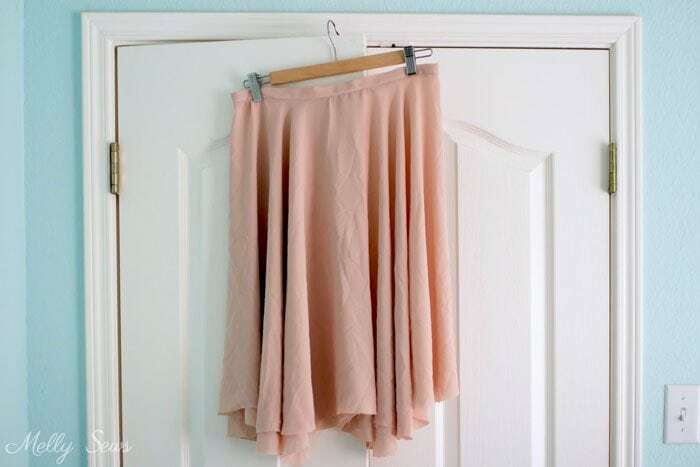 I’ve got a video of making this skirt below, and you can also watch it on YouTube here if the video won’t load for some reason. For a more detailed step by step, scroll below the video. To start, you need to measure your waist where you want the skirt to sit. This doesn’t have to be at your natural waist; choose the spot you feel is most flattering for you. 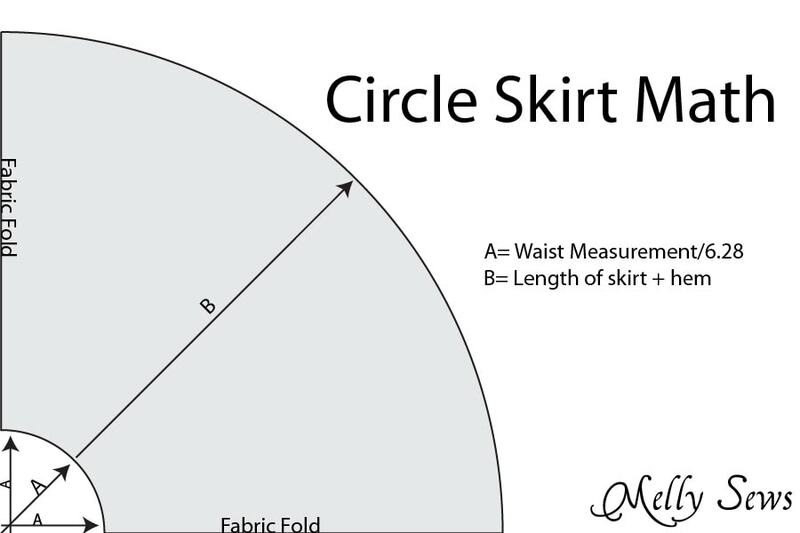 Then you need to do a little circle math – follow the diagram below if you’ve never made a circle skirt. A suggestion – cut the skirt as long as you can. You’ll lose some when you even out the hem later. 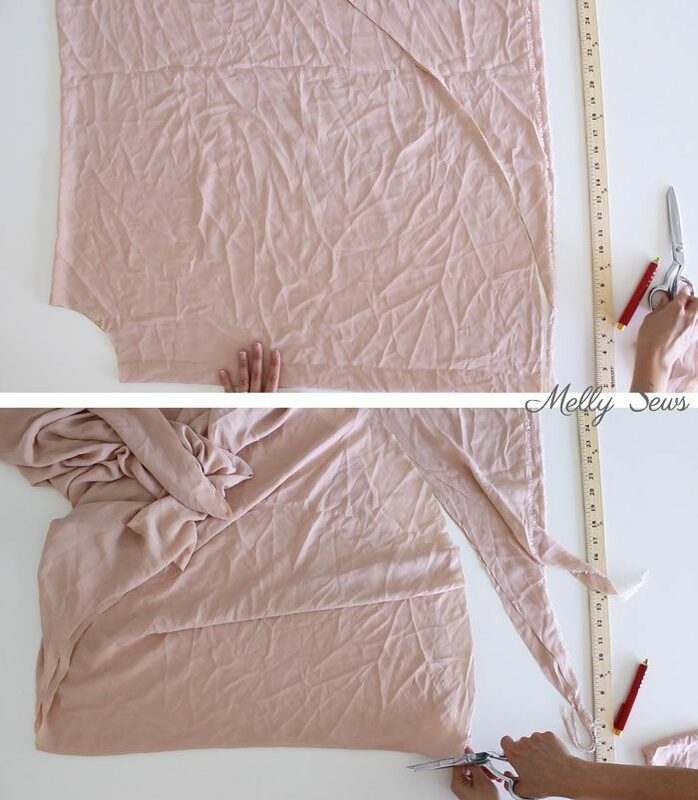 Fold your fabric so that the selvedges match, then fold the fabric again on the crossgrain. Working from the corner that has 4 folds and no raw edges, mark out a quarter circle that is your waist circumference divided by 6.28. Round that number down to the nearest 1/8 inch, because circles have bias areas and tend to stretch, so if you go up your skirt will be too big. Then measure from the waist marking out in another quarter circle to mark the hem of the skirt. Cut your skirt on both marks, and unfold to find a big donut. Note: if you want a longer skirt, or you’re working with narrower width fabric, you can cut two half circles and seam them together on the edges. Next, with your skirt folded into a half circle on the straight or cross grain, cut open one edge so that we can create a seam and add a zipper to it. 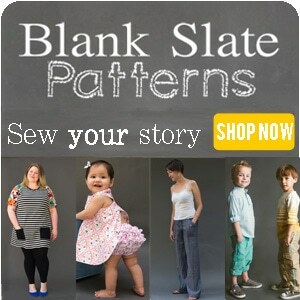 Cut a waistband that is at least 1 inch longer than your waist measurement and 2 1/2 inches wide. You want it that long so that you have 1/2 inch overhang at each end of the skirt. Prep the waistband by folding in half, wrong sides together and matching the long edges. Press, making a crease mark. Cut a 3/4 inch wide strip of fusible interfacing, and fuse it onto one side of the waistband, lined up with the crease mark on the wrong side. Finally, press the raw edge of the non-interfaced side of the waistband 1/2 inch to the wrong side. Follow this tutorial to install an invisible zipper and insert the zipper at the top of the seam. Unzip the zipper, then attach the interfaced side of the waistband to the skirt with 1/2 inch hanging beyond the skirt on each edge, pinning right sides together. If your skirt has stretched and is longer than the waistband, sew a gathering stitch around the top to gather it very slightly to fit the waistband. Fold the waistband right sides together on each end, and stitch across the short end next to the zipper. Turn band right side out, and then press the seam allowances up. Fold the inner part of the waistband over the seam, then stitch in the ditch on the right side to secure the waistband. Because parts of a circle skirt hang on the bias grain, it’s a good idea to hang the skirt overnight before hemming, to make sure you can get an even hem. When you pick the skirt back up later, you’ll need to trim the hem even. If you have a friend that can help you mark the hem, that’s idea, but if you don’t, this trick can work. Finally, sew a rolled hem on the skirt to finish it, and you’re done! 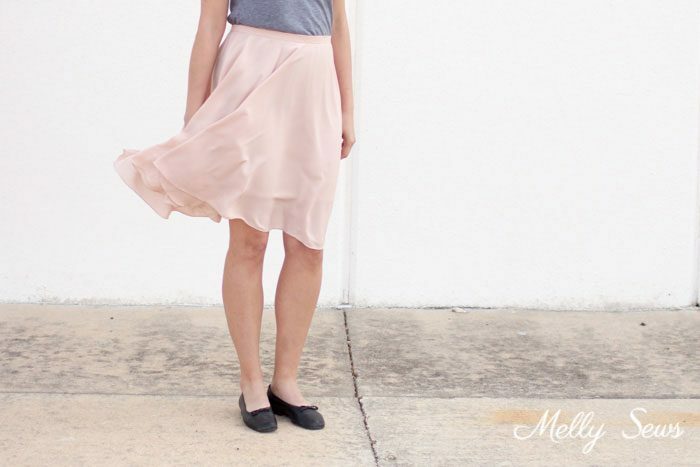 I’m not sure if this is the place to ask but….. what do y’all wear under lightweight skirts that seem so light and breezy they could put you in a Marilyn Monroe situation with your personal undergarments on display? I’ve tried wearing slip shorts and they don’t breathe and then I’m more hot than if I had just worn pants. THANKS!! 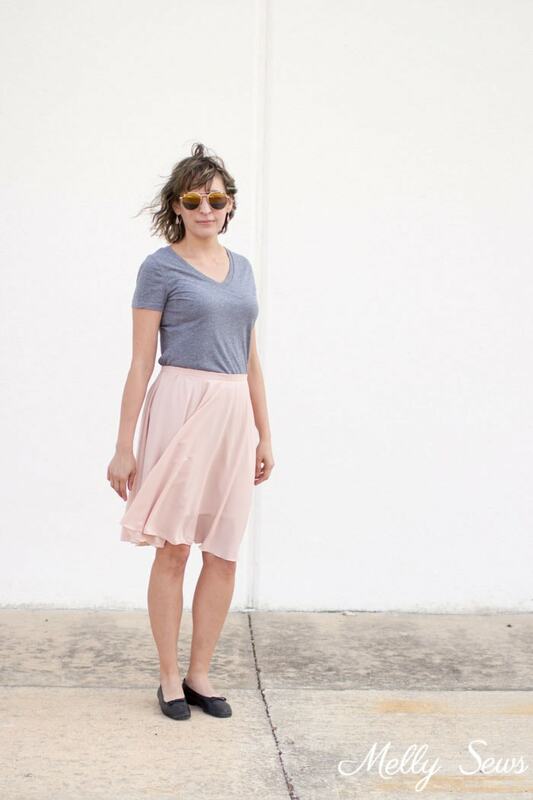 Your skirt posts always inspire me!!! This is a very spring-like, breezy skirt.You got me looking in my stash for these 2 yards…Thank you! Really Great Circle Skirt Presentation. You make it look so do-able & you explain everything so well. Good Job!! Keep it up. . .